I'm not a huge loose glitter fan... Loose glitter is messy and tricky and never seems to be worth the payoff (in my opinion). And yet for whatever reason I was drawn to Essence's selection of multidimensional glitters the last time I was at the pharmacy. I ended up picking up a cute mixture called Call Me Galaxy which had a variety of pink, blue and silver pastel glitters in it (of course). 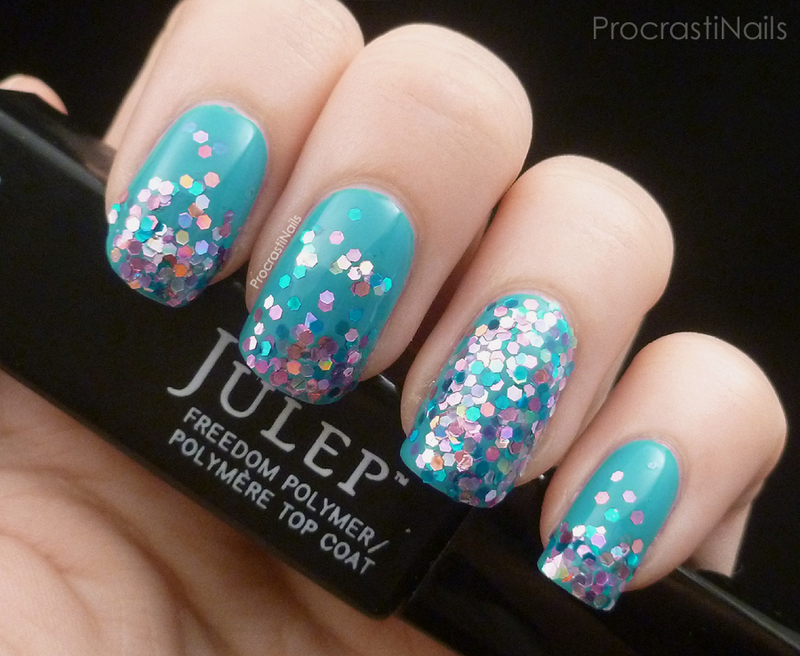 I decided to give it a try over Julep Lissa and I think the colours work together really well! It's very mermaid-ish imo. Basically I painted my base colour and once it dried I put a thick coat of top coat (in this case Julep Freedom Polymer Top Coat, but any non-fast drying top coat would work for this purpose) and then on my ring finger I just dumped a bunch of glitter on top. After a few seconds I patted it down and the tapped it to remove any remaining loose glitter. For my other nails I applied top coat on the bottom third of my nail and then gently poured a bit of glitter so it would give a quasi-gradient effect (or at least that's what I was going for). Then I used some extra top coat and a dotting tool to manually apply the scattered glitter going towards the tops of the nails. When things looked generally dry I gave them another gentle pat down and then sealed it with two more coats of top coat. Do you like working with loose glitter? Any tips that I should try next time? Let me know! What a nice gradient you created with the glitter. Its so fun! I really like these! The colors are beautiful! Also, what are your thoughts on that Polymer top coat? 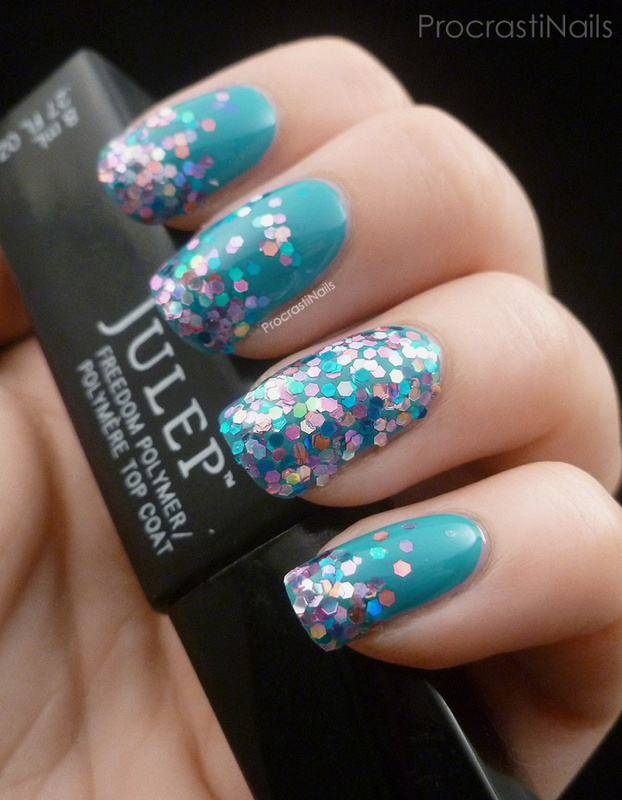 I was just gifted that Julep topcoat and have been testing it the past couple of days. I don't think it'll replace my quick drying top coat but I like wearing it when I have to work since my job is hard on my nails. Re: the top coat: generally I like it, it leaves a good shine and it doesn't take an eternity to dry (though it definitely isn't a quick dry). I've never actually 'cured' it properly with standard light, so if you're doing a wear test I'd be curious to see how it wear from applying and going about your day vs. applying and letting it cure under a light for the solid 5 mins they recommend!